Cities are known for being hyper industrial and smog-ridden, and Los Angeles is certainly no exception. But the city is making an effort to improve the quality of living for its citizens. The recent Sunset Triangle Plaza project is a perfect example of what major cities and even your own hometown can do to improve the local landscape. The Sunset Triangle Plaza is a highly-publicized street-to-plaza conversion that opened in Silver Lake in March 2012. Not only is it a beautiful spot to sun one’s self in the afternoon or enjoy an iced latte under a shady umbrella, but it is L.A’s first street-to-plaza conversion. With nothing but an idea from the organization, Streets for People, access to construction equipment rental, and lots of hard work and planning, The Sunset Triangle Plaza was completed in a few months. Hundreds of Silver Lakers (residents of the L.A. hipster refuge Silver Lake) converged on March 9, 2012 to celebrate the official opening of the plaza and to congratulate the Streets for People organization for a job well done. The goal of the project was to bring open spaces to Los Angeles in a cost-effective manner. Los Angeles is a city filled with traffic, smog, and very little time to stop and smell the roses. By incorporating a small plaza with patches of grass, umbrellas, and a relaxing fountain, projects like The Sunset Triangle Plaza hope to bring a bit of beauty to a city that, at times, is anything but. Los Angeles, often considered to be somewhat of a concrete jungle, is lacking in parks in some areas. Since the plaza is considered to be a trial in the city, the costs were low. The total cost of the project was about $25,000 and included construction equipment rental, paint costs, and labor. The majority of the project was funded by the Los Angeles County Department of Public Help, fundraising, and donations given to the Streets for People non-profit organization. The plaza was designed by Rios Clementi Hale, an extremely popular architecture firm, known for the unique Los Angelino flair they give to their projects. 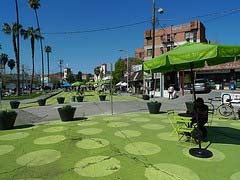 The plaza is painted lime green with yellow-green polka dots and is a bright addition to the City of Silver Lake. Although such street-to-plaza conversions are seemingly new to the city of Los Angeles, they have been popping up in New York for years and throughout Europe for centuries. Quaint European towns are known for their pedestrian zones, with streets filled with shops and restaurants that are closed to car traffic. While these are outrageously popular throughout Europe and in certain sections of New York, some worry about their practicality in Los Angeles. Sometimes, sections of streets are blocked off to make room for these street-to-plaza conversions. To construct The Sunset Triangle Plaza, for instance, one block of Griffith Boulevard was completely removed from through-traffic. Whether or not the project lasts more than a year, it’s the first of the kind in the area and a welcome place to kick back and take in the sunshine of a state known for it. If you are inspired by this project, why not initiate your own in your hometown? Contacting your local government is a great way to kick start an outdoor project and using The Sunset Triangle Plaza as an example definitely won’t hurt. Don’t hesitate to take actions that will improve your local environment. You, too, could have a gorgeous park where concrete once was. Encourage fresh air for you and your neighbors! This entry was posted in News and tagged Los Angeles County Department of Public Health, outdoor projects, Rios Clementi Hale, Silver Lake, street to plaza conversion, Sunset Triangle Plaza on April 22, 2012 by Carol Morgan.